Do you know where my missing classmates are today? "Thank you for sending me a copy of your book. it is very generous of you to donate 50% of the book's profits to charity, especially WaterAid. I very much admire your determination and commitment to the cause of poverty reduction. I hope the launch in New York went well, and that others are inspired by reading about your experiences." "I am delighted that you have been so persistent with your project. It is clearly an impressive achievement - congratulations on your UN talk and your skill in marketing the book to a world wide audience." Jonathan Dimbleby, journalist, author and presenter of BBC Radio 4's "Any Questions? 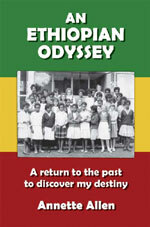 "These voices of women who had been classmates in Addis Ababa in the 60s show us the human face of globalization. It is appropriate that part of the royalties go to WaterAid, recognizing the vital importance of water as a human right for women and girls"
"Thank you so much for sending me a copy of 'An Ethiopian Odyssey' and for the beautiful description of my father, Sam. It is a very sweet book written by a woman with a wonderful dream, and I wanted to congratulate you on getting it published." "I read Annette's inspiring account with great interest. As well as documenting an exciting, personal adventure in which she encounters both old friends and new faces, Annette highlights a number of important issues. She tells a story of a beautiful country and shows a real insight into Ethiopia. Annette has honed in on the crucial point about access to water. As a member of the International Development Select Committee, which recently conducted an inquiry into water and sanitation, I know the importance of clean water both to individuals and to a country's wider development. Annette's commendable dedication to this cause and her willingness to donate part of the proceeds to WaterAid will do much to help the people of Ethiopia." I read your book with great interest. It tells the story of a very personal journey. I wish you every success with the book.